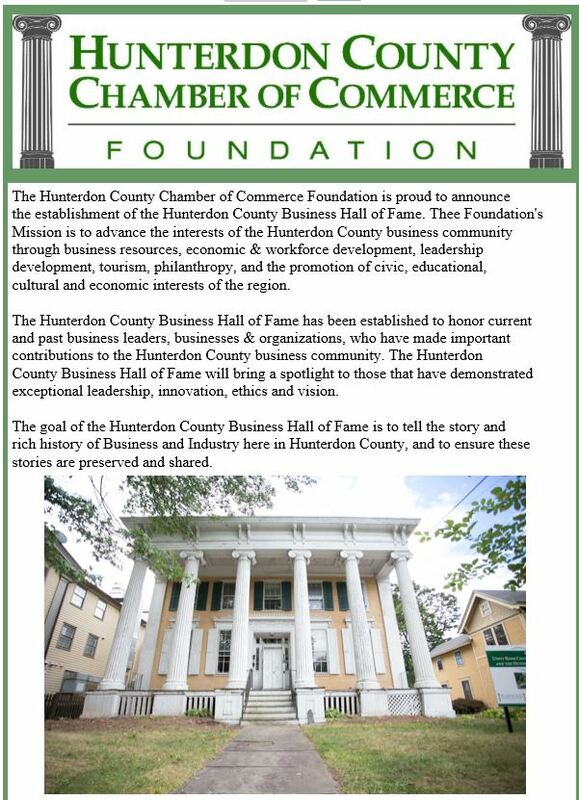 BKC, CPAs, PC is presenting sponsor for the Hunterdon County Business Hall of Fame established by the Hunterdon County Chamber of Commerce Foundation. Thee Foundation’s Mission is to advance the interests of the Hunterdon County business community through business resources, economic & workforce development, leadership development, tourism, philanthropy, and the promotion of civic, educational, cultural and economic interests of the region. The Hunterdon County Business Hall of Fame has been established to honor current and past business leaders, businesses & organizations, who have made important contributions to the Hunterdon County business community. The Hunterdon County Business Hall of Fame will bring a spotlight to those that have demonstrated exceptional leadership, innovation, ethics and vision. George Large and Edwin Large; and Red Mill Museum Village: Essence of Hunterdon – an organization or individual that has enhanced the community, fostered business and community partnership through leadership, courageous thought and entrepreneurial spirit. For more information on the event and for sponsorships and ticket purchases click here.